Royal Observer Corps cap badges for sale. The size and design Royal Observer Corps badge can vary depending on the rank of the wearer. 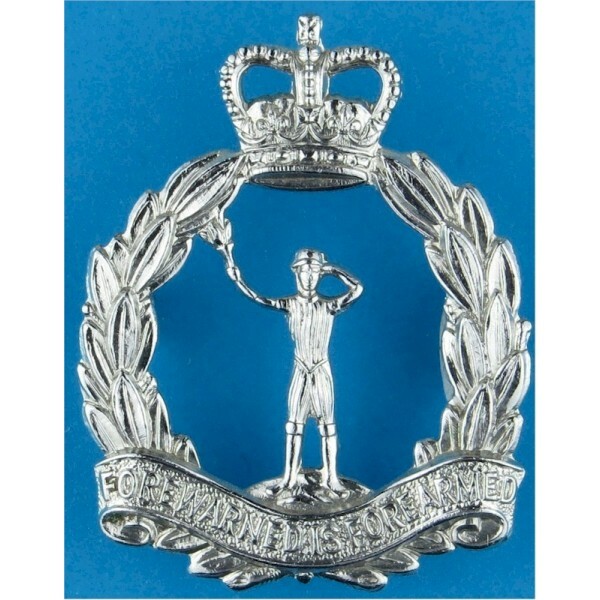 Ordinary Observers (as opposed to Observer Officers) tend to have White Metal or chrome-plated (silver coloured) cap badges. Observer Officers had gilt (gold coloured) cap badges for the beret. Royal Observer Corps Officers also had a different design of badge for the peaked (visor) cap, which was a mix of gilt metal and bullion wire embroidery. The crowns on ROC cap badges can be a useful guide to identifying and dating them - King's Crowns are a different shape to Queen's Crowns.